For 25 years I have been a member of University Faculty for Life. A scholarly organization devoted to research on human life issues—with particular attention to abortion, infanticide and euthanasia—U.F.L. hosts an annual conference for the presentation of academic papers. The association is nonsectarian. We have our distinguished atheists: Nat Hentoff of The Village Voice and Doris Gordon of Libertarians for Life. But most of us are religious people, committed to the tenets of our particular faith. Catholics, evangelical Protestants, Orthodox Jews and Mormons have long been active association members. Like many similar American organizations, U.F.L. has ushered in an unexpected type of ecumenism. Members adhere to mutually contradictory creeds, often with soul-converting ardor. But they also bring a religious ardor to their commitment to the pro-life cause and its associated political formations. Their exclusivist religious commitment is matched by a moral solidarity with fellow pro-lifers they might consider theologically misguided. Many have sacrificed their lives, their time and their treasure to the defense of innocent human life. Each conference brings testimony from the pharmacist fired for refusing to dispense the “morning after” pill or the gynecologist pressured to provide abortion referrals. Some U.F.L. members ask that their names not be listed in the organization’s directory because of well-founded fears of political retribution in the academy. But for all this moral solidarity, there is little interest in common prayer or doctrinal consensus. Last year at our conference in San Francisco, the association’s Catholics attended Mass in a chapel apart from the conference site. Several Protestants also attended. Since it was the feast of Corpus Christi, the celebrant used his sermon to explain the doctrine of transubstantiation and to describe a medieval chapel in Italy where a eucharistic miracle allegedly occurred. At the U.F.L. banquet later that evening, an evangelical explained that his experience of the Mass had reminded him why he could never become a Roman Catholic. He wondered how anyone could accept this strange metaphysics and this even stranger miracle, which appeared to be a kind of cannibalism. Two years ago at our conference at Brigham Young University in Provo, Utah, I was asked to deliver the benediction before dinner. I prayed that as we interacted with people of different faiths, we would always try to “get our facts straight.” Immediately after the prayer’s conclusion, our Mormon host rushed up to ask me if someone had said something offensive. I responded in the negative; I had only wanted to encourage the ecumenical good will already present at the conference. During the dinner with Mormon students and faculty members, I could only admire their missionary zeal, but nothing erased my doubts about the credibility of Joseph Smith, the religion’s founder. When I tried to explain the Catholic doctrine of purgatory in response to a question, I suspect I only confirmed seven Mormon souls as to why they could never become Catholics. The moral and political ecumenism represented by groups like U.F.L. is rather different from the ecumenism most of us expected in the immediate aftermath of the Second Vatican Council. Dialogue with mainstream liberal Protestant churches seemed much easier than dialogue with evangelicals, so distant from Catholicism in doctrine and piety and still suspicious as to whether Catholicism was even Christian. Interreligious dialogue with Reform Judaism seemed more obvious than outreach to Orthodox Judaism, far more particularistic in its theology and separatist in its practices. But as the cultural revolutions of the 1960s destroyed a longstanding social consensus concerning the ethics of human life, Catholic, evangelical, Orthodox Jewish and Mormon activists suddenly found themselves on common ground opposing a burgeoning culture of death. The growing political coercion of conscience by this culture has only strengthened this solidarity. It is a strange ecumenism where the members of a moral coalition not so secretly consider each other heretical, idolatrous or just plain crazy. But the summons to defend human life, the human family and religious freedom in our divided society has fostered such an unexpected coalition of the willing. As Jesuit priest, Professor John J. Conley points out in "Unexpected Ecumenism" it creates a "strange ecumenism" when members who have been considered heretical, even idolatrous, form a moral coalition in defense of human life. As Pope Francis has said, "God is not Catholic!" Neither is he Protestant, Islamic, or in any other way religiously affiliated. Religion seeks to encapsulate God into private ownership. God cannot be encapsulated. Simply and plainly, God is not "Religious" - he is Spiritual. So I suspect its the innate human sense of spirituality that nourishes strange and unexpected ecumenism. That's positively wonderful! Many so inclined and others, have sacrificed their lives in defense of innocent human life. Not so always and shockingly even under the guidance of religion, as the exploding "Tuan super scandal" involving 800 children buried in a mass septic tank grave, shows. And not just then, but in our time too, in diverse ways and from diverse sources, significantly through legalized abortion, we are witnessing the uterine killing of innocent human life, to date in excess of 40,000,000 babies in various stages of biological development, but in possession of a fully formed immortal soul! These children were not buried in a mass septic tank grave. Instead they were tossed into surgical garbage cans to be incinerated with "other trash!" God grant that unexpected and strange ecumenisms defending human life and for that matter the ecology of the cosmos, become increasingly vibrant. Perhaps Father Conley could fill us in on the moral ardor the University Faculty for Life as an organization and its members as individuals, including of course himself, brought to opposing the unjust and unjustified invasion of Iraq. I am all ears! This article also appeared in print, under the headline "Unexpected Ecumenism," in the June 9-16, 2014 issue. 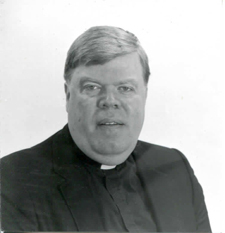 John J. Conley, S.J., holds the Knott Chair in Philosophy and Theology at Loyola University Maryland in Baltimore, Md.